For direct enquiries please email us or call +61 409 241 158 to contact the Guest Residences directly. A luxurious, personal and unique alternative to a five star hotel suite. 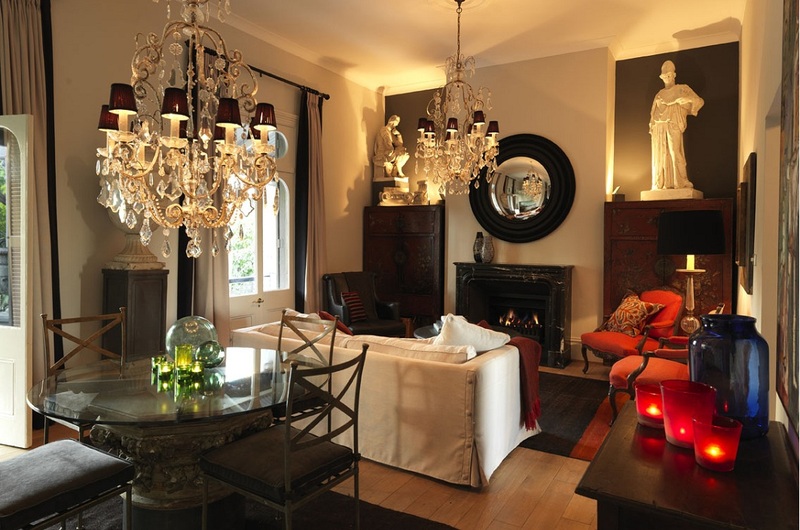 Each apartment is defined by a modern and eccentric character, luxurious comfort and grand style. Decorated for your delight and dedicated to the needs of the leisure and business travellers alike Guest Residences by The Country Trader ensure your Sydney visit is the ultimate experience. Situated in a quiet residential street, just moments from Potts Point, Sydney Harbour and Rushcutters Bay Park, the residences are also within minutes of the Sydney nightclubs of Oxford Street and Kings Cross. For those with dining in mind you will find yourself central to the most renowned dining precinct in Sydney, boasting a multitude of world famous restaurants and cafes. Less than 5 minutes’ walk to major bus and train connections, there simply couldn’t be a better residential location to experience Sydney and its lifestyle. With attention paid to every detail of luxurious living, Guest Residences by The Country Trader have redefined and set a new benchmark for visitors to Sydney, unparalleled even by the suites of Sydney‘s most luxurious hotels. At Guest Residences by The Country Trader you will find three exquisite and distinctive private residences. Each has a unique floor plan and has been personally created by the iconic team at The Country Trader. Boasting a long and well published history as leaders in interior design, furnishings and decoration The Country Trader team have excelled in delivering a rarefied comfort seeped in sumptuous luxury. Decorated with the owner of The Country Trader Geoff Clark’s extended private collection of amazing one-off pieces, the team has stopped at nothing to create the perfect ambiance of eclectic luxury, amidst which you can now holiday. The apartments are fully self-contained to the highest standards with every provision you would expect in a 5 star hotel suite plus much more. A life of travel has driven Geoff to think of every detail from the shoe cleaning kit, to shower brush, picnic baskets and beach towels; in fact, every little touch to make your stay a pleasure. Each suite is well provisioned for exquisite home entertaining, whether it be in the sumptuous sitting and dining rooms or outdoor terraces designed specifically to take advantage of the Sydney summer or to be toasty warm in front of the fireplace through winter. Each of the boutique homes has a sumptuous king size bed, sleek bathroom and modern, fully equipped kitchen. Only the best of the best, the bathrooms all utilise luxurious products, the finest cotton linens and towels. The latest technology with plasma TVs, high speed wireless Internet, complementary telephone and sound systems. The kitchens contain everything you will need to dine at home with a group of friends or have drinks before heading out to the hundreds of restaurants within easy walking distance. Within 100 metres you will find boutique delis and major supermarkets allowing you to take advantage of the Residences’ capacity for at home dining.